There will be two opportunities for Guests to participate in casino play at this year's fundraiser: (a) Non-Tournament Play and (b) “High Roller” Tournament Play. Below is a description of each. Note: "Buy-Ins" must be purchased prior to March 21, 2014 to play in the "High Roller" Tournaments; no "Buy-Ins" will be allowed the night of the event. With the purchase of an event eTicket, each Guest will receive Casino Cash. This Casino Cash can be turned in for Casino Chips at any of the casino tables outside of the “High Roller” Tournament Play area. Non-Tournament casino tables will consist of Blackjack, Roulette and Craps. Non-Tournament Play will be open for Guests to enjoy before and after dinner with limited spots available. Casino Winnings from Non-Tournament Play may only be used to enter the Casino Winnings Drawing for great prizes! Every $100 in Casino Chips will buy you one (1) ticket to enter the Casino Winnings Drawing. Dealers at the casino tables will cash out your Casino Chips and convert your winnings to tickets for the Casino Winnings Drawing. The Casino Winnings Drawing will take place at the end of the evening and you must be present to win. Two Tournaments will occur simultaneously in the “High Roller” Tournament Play area from 8:45 – 10:45pm: a Texas Hold ‘Em Tournament and a Blackjack Tournament. 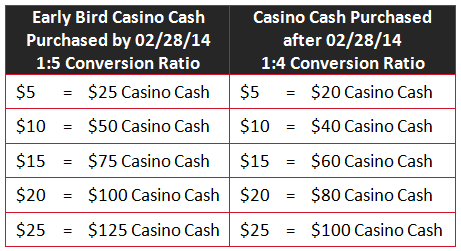 “Buy-In” for the Tournaments must be pre-purchased at $40 each ($50 if purchased between 03/01/14 - 03/21/14). A Guest may only participate in one of the two Tournaments and event registration is required to participate in a Tournament. Tournament Players will each be given a Seat Card. This Seat Card will tell the Player their starting table name and seat number. There will be 8 seats at each Texas Hold ‘Em table and 6 seats at each Blackjack table. Upon arriving at the table, the Dealer will give each Player $1,500 in starting Casino Chips. Since Players play against one another in a Texas Hold ‘Em Tournament, the Players in this Tournament will play until there is a final winner or 2 hours of play has completed; whichever comes first. If the latter, a Chip count will be done to determine the top three Winners of the Texas Hold ‘Em Tournament. Since Players play against the Dealer in a Blackjack Tournament, the Players in this Tournament will play until 2 hours of play has completed or until they lose all of their Chips. At the end of the 2 hour play, a Chip count will be done to determine the top three Winners of the Blackjack Tournament. Each Tournament will have its own “pot” based on the number of Seats sold for that Tournament (calculated at $40/Seat). The top three Winners in each Tournament will be awarded Gift Card Vouchers as follows: 1st Place – 25% of the pot, 2nd Place – 20% of the pot, and 3rd Place – 15% of the pot. Gift Card Vouchers may be redeemed for gift cards offered through CTK’s Gift Card Program. Additional Casino Cash may not be purchased for “High Roller” Tournament Play. If a Tournament Player gets eliminated from Tournament Play, he/she may continue casino play in Non-Tournament Play with the Casino Cash that was included with the purchase of his/her event eTicket and/or extra Casino Cash purchased.